Drummond, Ian M.. "Economic History of Canada". The Canadian Encyclopedia, 10 April 2018, Historica Canada. https://www.thecanadianencyclopedia.ca/en/article/economic-history. Accessed 20 April 2019. 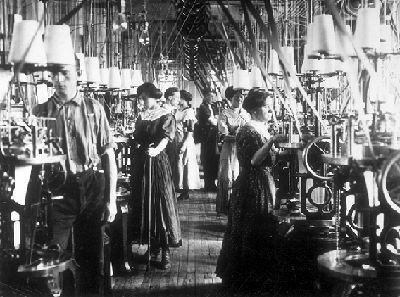 Factory life changed the economic structure of society. 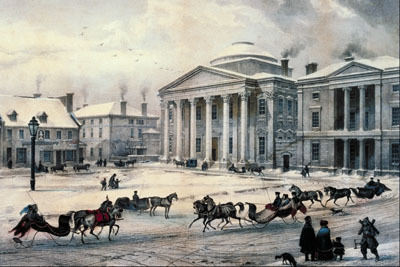 By 1847, this public square was symbolic of Montréal's power as the commercial and financial metropolis of Canada. Illustration by Cornelius Kreighoff (courtesy Library and Archives Canada/C-48). In the pre-industrial economy, craftsmen produced according to the needs of their customers, using hand tools (courtesy NMC/75-14258). 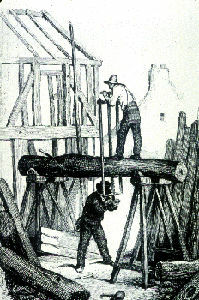 Early in industrialization, usually only large factories were able to use the costly and heavy steam engine. 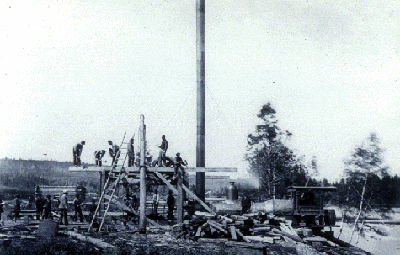 The sawmill on Matapedia Lake (1880) ingeniously used an old steam locomotive as the motor by extending its smokestack. 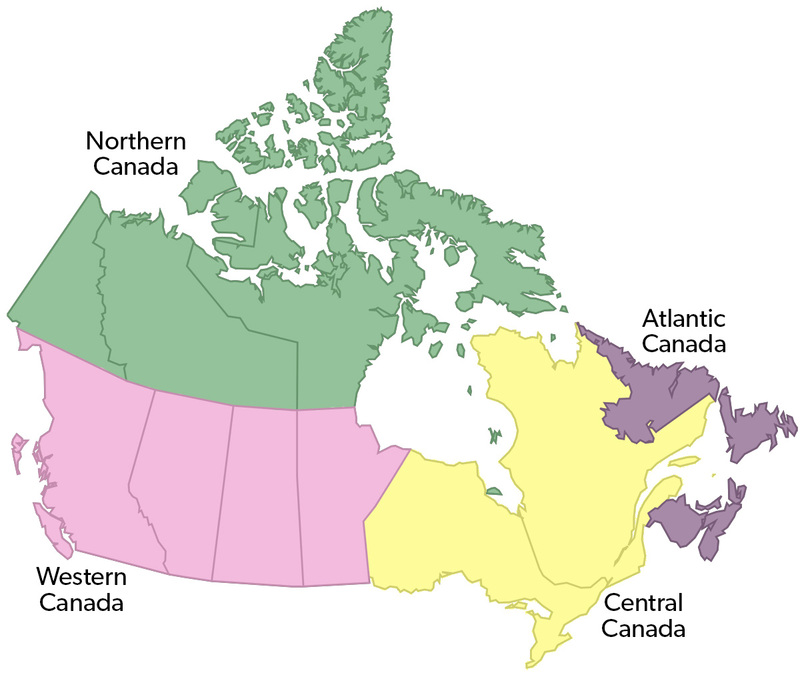 The fur trade first created a single transcontinental trading economy; since Confederation in 1867, labour and finance have moved freely among the regions. Improvements in transportation — the railways between 1867 and 1915 (see Railway History), and the highway and pipeline systems after 1945 — have helped. The provinces have become important markets and suppliers for one another, so that an investment boom in one region such as the Prairie West could create a nationwide boom, while a slump in Ontario manufacturing becomes a nationwide slump. By the 1980s, most Canadians had become city dwellers, and the majority of workers were in white-collar jobs, generally in the service-producing industries (see Urbanization). Disparities in earnings, living standards and ways of life had been much reduced, especially after 1945 (see Income Distribution). Nevertheless, the various regional economies were still very different. Manufacturing remained largely a matter for Ontario and Quebec, while the four western provinces still generated immense surpluses of natural products. In the Atlantic provinces, living standards after 1945 remained comparatively low and prospects less bright. Partly for this reason, interregional subsidies have become deeply entrenched in Canada’s way of life (see Equalization Payments). Economic history includes the study of the evolution of the economy and economic institutions. Dating to the 19th century, the subject uses ideas from economics, history, geography and political science. It must not be confused with the history of economic ideas or with the interpretation of general history using economic forces. Distinctive contributions to Canada’s economic history came in the 1920s and 1930s both from economists such as Harold Innis, and from historians such as Donald Creighton, who stressed the importance of what they called “staple products” whose markets were abroad (see Staple Thesis). Emphasizing the importance of Canada’s distinctive geography — the Canadian Shield and the Great Lakes–St. Lawrence system — they traced interactions between geography, resources, foreign markets and the inflow of people and funds from abroad. They treated regional growth in relation to the staple products. More recent approaches have supplemented the old with modern economics and statistics. Work has been done in areas including working class history, urban growth, business history, the industrial development of central Canada, that fitted rather poorly into the Staple Thesis. Meanwhile, historical geographers produce invaluable material on settlement patterns and on the growth of towns, while regional studies, which staple theorists treated as components of nation-building, have become routes to regional self-confidence, especially in Quebec and Atlantic Canada. Marxist scholars share business and labour history and other fields with scholars whose ideologies are very different.